Lake Garda is one of the most popular holiday regions in Italy. Especially camping friends feel very well because of the mild climate and the beautiful surrounding. Around Lake Garda are many excellent campsites with large pool areas and often a private beach. Due to the close mountains the campsites at the northern part of Lake Garda are not as big as the ones in the South. And the beaches are much smaller, but the alpine panorama compensates this fact. 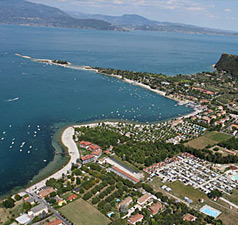 The campsites at the southern part of Lake Garda are spacious and offer large beaches. The high standard and the good shape of all campsites at Lake Garda ensure that everyone can find the right kind of camping holiday. Whether he prefers camping with his own tent or a luxury campsite. People who do not own a caravan can rent mobile homes or bungalows.